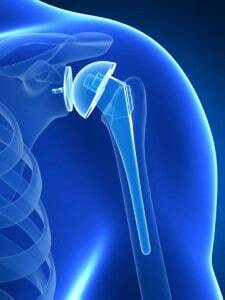 Reverse shoulder replacement surgery differs from standard replacement because the ball and joint of the shoulder switch places. In essence, the socket rotates on the outer side of the ball. This is a complicated surgery warranted by certain conditions. It provides significant pain relief and helps improve range of motion of the joint, although after surgery there is some limitation. the rotator cuff tendons are gone or torn. In the event of torn or missing rotator cuff tendons, a person is unable to lift the arm enough to be functional. There may or may not be pain but the main reason for replacement is to regain functionality and motion. After surgery, several doses of antibiotics are given to reduce the risk of infection. Pain medication will help relieve pain. Most patients can eat a solid diet and get out of bed the day after surgery. Discharge to go home is on the second or third day after surgery. The arm will be in a sling on discharge from the hospital. The surgeon may provide instruction for gentle range of motion exercises to build mobility and endurance. Physical Therapy may also be ordered. This entry was posted in Shoulder Treatment and tagged Reverse Shoulder Replacement Surgery, rotator cuff tendons on November 21, 2018 by aenriquez.